A new poll showed centrist candidate Emmanuel Macron for the first time beating the far right's Marine Le Pen in the initial round of the French presidential elections next month. 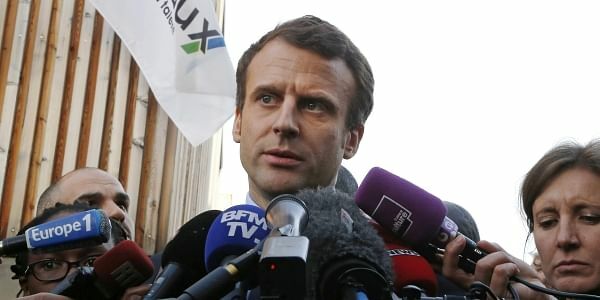 PARIS: A new poll Thursday showed centrist candidate Emmanuel Macron for the first time beating the far right's Marine Le Pen in the initial round of the French presidential elections next month. Macron's lead comes as a growing list of backers from both the left and the centre throw their support behind the 39-year-old former economy minister who is trying to upend France's traditional politics. The Harris Interactive poll showed Macron taking 26 percent of the vote on April 23 -- a six-point gain in two weeks -- compared to 25 percent for National Front leader Le Pen, who had long been leading in the first round. In the likely event that no one wins an outright majority, a run-off between the two top candidates will be held on May 7. The Harris poll shows Macron would take 65 percent of that vote to Le Pen's 35 percent. Though no polls currently show her winning, anti-immigration nationalist Le Pen is hoping to emulate the shock success of President Donald Trump in US elections last year. In a boost to his campaign on Wednesday, Macron won the backing of Socialist former Paris mayor Bertrand Delanoe who called him "a reformist, a European and a realist". Delanoe, who oversaw the French capital from 2001 to 2014, told France Inter radio he backed Macron because it was essential to "throw the most weight possible behind the candidate who can beat Madam Le Pen in the first round". His stance on the prospect of a Le Pen presidency was echoed by France's ambassador to Japan, who on Wednesday broke diplomatic protocol by stating publicly that he would refuse to serve if she won. "If the French tragedy comes to pass and leads to her election, I would withdraw from all my diplomatic functions," Thierry Dana, 60, wrote in a column in Le Monde newspaper. A former investment banker who quit the Socialist government in August to prepare a bid for the presidency, Macron has risen fast in opinion polls, but has never won elected office. In remarks on International Women's Day on Wednesday, he suggested he would ideally name a woman as prime minister if he were to win the keys to the Elysee Palace. "To be honest, it's too easy to say it this evening. But I've spoken to others, starting with men, and that's what I wish really," he said, when asked if he would name a female PM at a public rally in Paris. An already unpredictable French election has become even harder to call given the legal woes afflicting the conservative challenger Francois Fillon, who is embroiled in a "fake jobs" scandal. In another blow, the investigative paper Le Canard Enchaine published new claims late Tuesday that the scandal-hit Fillon had failed to declare an interest-free loan of 50,000 euros ($53,000) from a billionaire friend. Once the frontrunner in the race, Fillon has slipped to third in the polls and the gap between him and Macron and Le Pen appears to be widening. Delanoe's support for the Macron campaign is a blow for the Socialist candidate for the presidency, Benoit Hamon, whose hard-left policies have led some commentators to dismiss him as unelectable. Macron still has his detractors though, with veteran conservative former prime minster Alain Juppe describing him this week as "politically naive". Macron told AFP in an interview Tuesday that he will defend France's middle classes, which he says have been ignored by the left and right. He claimed that both the outgoing Socialist government under President Francois Hollande -- in which he served -- and their right-wing opponents have let down the middle classes, assailed by job cuts and an increasing tax burden. "The right talks about the France that is succeeding, the left talks about the workers who are struggling the most," he said. "They have forgotten the middle classes." Macron claimed that snubbing middle earners had led to Britain's Brexit vote and to Trump's victory in the United States. "Democracies that have succeeded economically by depending only on the classes that succeed... while forgetting the middle classes, are shattered by the rise of extremes," he said.